Many of our members in New York and New Jersey are still without power and will be for the next few weeks. The houses of a few members were destroyed by the devastating hurricane including a member of Coast Guard Local 2747. Some areas of New Jersey have issued a curfew due to the widespread power outage but the potential of looters still lingers. In addition, the gas shortage has greatly affected members’ ability to get to work. The aftermath of the storm is now affecting voting in both New York and New Jersey as many people’s voting location has changed. Please check with your local Board of Elections for more information. We will continue to keep you posted about the status of our members affected by Superstorm Sandy. The massive hurricane that swept through the East Coast has caused millions to go without power and has left many homes, businesses and personal items damaged or destroyed. The storm has also resulted in many closed doors at local government agency facilities due to lack of electricity. However, AFGE has received word from BOP representatives who say that neither the Metropolitan Correctional Center in Manhattan and Metropolitan Detention Center in Brooklyn had to shut down or move inmates, though the prisons are not back to normal operations. Currently MCC New York is operating on a generator power and officers in MDC Brooklyn were forced to stay at the facility and sleep on cots, which resulted in major car loss because of parking lot flooding. Due to these problems and other factors, officers are having a hard time getting to and from the facilities. Stay tuned for updates from other agencies that experienced disruptions during the storm. 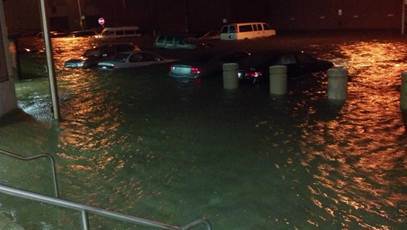 The parking lot of the Metropolitan Detention Center in Brooklyn shortly after the storm passed through. The very first AFGE Y.O.U.N.G. (Young Organizing Unionists for the Next Generation) AFGE Training Summit was held August 11th & 12th in Las Vegas in conjunction with AFGE’s 39th National Convention. Over 200 young union members and seasoned mentors came together to find empowerment, education and inspiration to be true leaders and activists to secure the future of AFGE and the Labor Movement. The theme for the training summit was “Connecting the Dots”. The summit was designed to show that everything working Americans are experiencing right now is not unintentional and each attack we are facing is an individual dot that creates a very ugly picture for our future. Learn more about AFGE Y.O.U.N.G. in the video below. Click here to see photos from the summit. 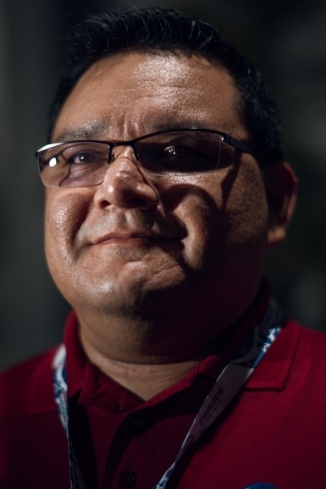 AFGE Social Security Council 220 National Secretary and Local 3272 President, Rosendo Rocha, was recently featured in a “Time” Magazine online photo story about the Democratic National Convention. Rocha served as a delegate from Michigan. Please click here to view the complete story. Rosendo Rocha, AFGE SSA Council 220 Secretary and Local 3272 President, attended the DNC as a Michigan delegate. earned for their whole lives,” said Rocha. The attacks on September 11, 2001, had a devastating effect on federal employees and military service members. The Pentagon took a direct hit, killing dozens of workers. Federal employees also were at the World Trade Center in New York City and on the airplanes that were used as weapons that fateful day. The government’s response was immediate: federal employees, both civilian and military, sprung into action and were on the front lines of the rescue, recovery and investigation efforts. Max Beilke, retired Army master sergeant, 69, Laurel, Md. Carrie Blagburn, 48, Temple Hills, Md. Sharon Carver, 38, Waldorf, Md. John J. Chada, 55, Manassas, Va.
Ada M. Davis, 57, Camp Springs, Md. Diana Borrero de Padro, 55, Woodbridge, Va.
Amelia V. Fields, 36, Dumfries, Va.
Cortez Ghee, 54, Reiserstown, Md. Brenda C. Gibson, 59, Falls Church, Va.
Samantha Lightbourn-Allen, 36, Hillside, Md. Carolyn B. Halmon, 49, Washington, D.C.
David W. Laychak, 40, Manassas, Va.
Teresa M. Martin, 45, Stafford, Va.
Ada L. Mason-Acker, 50, Springfield, Va.
Robert J. Maxwell, 53, Manassas, Va.
Odessa V. Morris, 54, Upper Marlboro, Md. Ted H. Moy, 48, Silver Spring, Md. Rhonda S. Rasmussen, 44, Woodbridge, Va.
Deborah Ramsaur, 45, Annandale, Va.
Martha M. Reszke, 56, Stafford, Va.
Edward V. Rowenhorst, 32, Fredricksburg, Va.
Robert Russell, 52, Oxen Hill, Md. Marjorie C. Salamone, 53, Springfield, Va.
Michael Selves, 53, Fairfax, Va.
Marian H. Serva, 47, Stafford, Va.
Antionette Sherman, 35, Forest Heights, Md. Donald D. Simmons, 58, Dumfries, Va.
Cheryle D. Sincock, 53, Dale City, Va.
Gary F. Smith, retired Army lieutenant colonel, 55, Alexandria, Va.
Edna L. Stephens, 53, Washington, D.C.
Patricia J. Statz, 41, Tacoma Park, Md. Sandra C. Taylor, 50, Alexandria, Va.
Willie Q. Troy, 51, Aberdeen Proving Ground, Md. Meta L. Waller, 60, Alexandria, Va.
Sandra L. White, 44, Dumfries, Va.
Lisa L. Young, 36, Germantown, Md. Angela Houtz, 27, La Plata, Md. Brady Howell, 26, Arlington, Va.
Judith Jones, 53, Woodbridge, Va.
James T. Lynch, 55, Manassas, Va.
Jack Punches, retired Navy captain, 51, Clifton, Va.
Marvin Woods, 58, Great Mills, Md. Allen Boyle, 30, Fredericksburg, Va.
Rosa Maria Chapa, 64, Springfield, Va.
Sandra N. Foster, 41, Clinton, Md. Robert J. Hymel, 55, Woodbridge, Va.
Shelley A. Marshall, 37, Marbury, Md. Patricia E. Mickley, 41, Springfield, Va.
Charles E. Sabin, 54, Burke, Va.
Karl W. Teepe, 57, Centreville, Va.
David Bernard, 57, IRS, Chelmsford, Mass. Leonard Hatton, 45, FBI, Ridgefield Park, N.J.
Bryan Jack, 48, Defense Department, Alexandria, Va. Aboard Flight 93, in Shanksville, Pa.
Marion Britton, 53, Census Bureau, Brooklyn, N.Y.
Richard Guadagno, 39, Fish and Wildlife Service, Eureka, Calif.
Waleska Martinez, 37, Census Bureau, Jersey City, N.J.
Herbert W. Homer, 48, Defense Contract Management Agency, Milford, Mass. AFGE Local 1633 President Anthony McCray with the Department of Veterans Affairs discusses his work as a union activist and the importance of supporting our nation’s veterans. Like revivals of old, AFGE’s annual call to come on down to Washington, DC in February is a call to inspire its activist members and get new converts on board the legislative action train. The Union traded in a tent for the Hyatt, but the passion AFGE leaders will bring to the 2012 Legislative Conference is focused on igniting a response among the hardworking but often cautious faithful. Well, folks, let me say this: you can’t just sit at your desk and hope that a pay freeze is not extended another year or more. You can’t just assume that Congress isn’t going to hack away at your hard-earned retirement benefits. The Union is only as loud as the voices of its members. You need to witness your story. The AFGE Legislative revival, oops – conference – gives us the tools to take a clear message to the halls of Congress. When we make an appointment with the staff of our Senators and Congressional representatives, we’ll be taking that message and delivering it with our story. The account of what happens to infants subjected to environmental hazards. These are your stories. 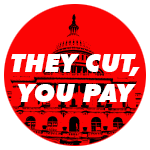 Your Senators and Representatives need to hear more from you.